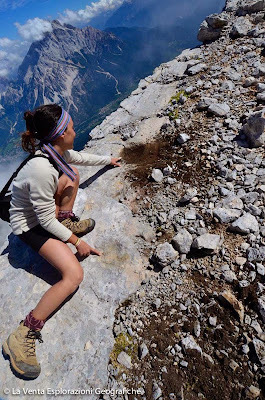 In September 2011 a group of five speleologists and mountaineers of La Venta Association spotted a possible track of dinosaur footprints at 3025 meters on the North-east ridge of Mount Pelmo in the Dolomites. Mauro "Lampo" Olivotto, the known sculptor and mountaineer from the Cadore area and author of sculptures known as "Giauli", is the promoter of an extravagant mission suspended among art, mountaineering and poetry: reaching a big cave in the middle of Mount Pelmo's rock face to cast a photographic set for his wooden characters. The enterprise was accomplished on 10th and 11th September 2011 thanks to four speleologists and mountaineers of La Venta Association of Geographical Explorations. 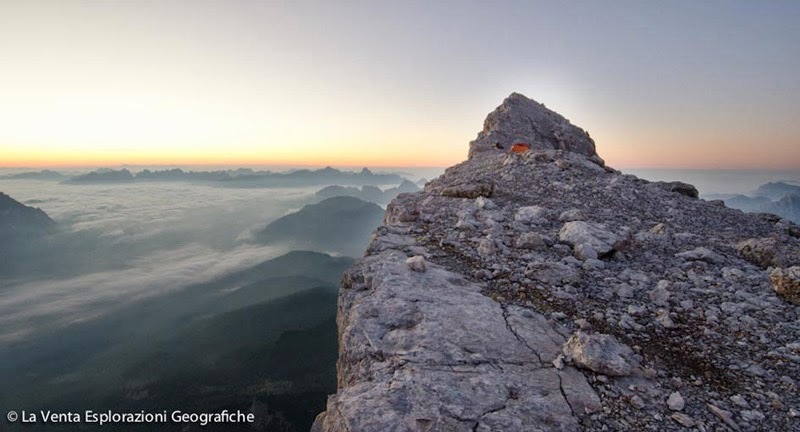 The exploration required establishing a small camp on the north-east ridge of Mount Pelmo, which gave them the time to abseil down to the cavity called the Giauli Cave. This over 150 meter descent down the almost 1000m high face was equipped by speleologist Antonio De Vivo from Treviso. Close to the camp, in the middle of the ridge, geologist Francesco Sauro and speleologist Roberta Tanduo from Padua spotted a series of depressions resembling, due to their shape and disposition, dinosaur footprints. On closer inspection the rocky surface revealed a track formed by five possible footprints placed inthe same direction and evenly distanced. The footprints were documented with photos and videos by videomaker Enzo Procopio. Then the images were analysed by paleontologist Matteo Belvedere PhD (University of Padua), who confirmed the hypothesis, stating: "Almost all the depressions found are surrounded by a relief, an edge called an "expulsion edge" which indicates that the depression is not linked to karstification but to the impression of an object in the sediment itself. The series of dinosaur footprints found on the summit of Monte Pelmo, Dolomites. Because of their alignment, the depressions can be interpreted as footprints of a biped animal, but this hypothesis can only be supported by future surveys. The bad state of conservation due the karst nature of the rock and to the exposure to atmospheric agents, have not allowed us to precisely determine the animal species. Nonetheless the dimensions (about 15-20 cm/6-8 inches of length) and the biped stride let us suppose they could belong to a carnivorous dinosaur of small-mid dimension (3-4 meters/10-13 feet), similar to a Coelophysis." 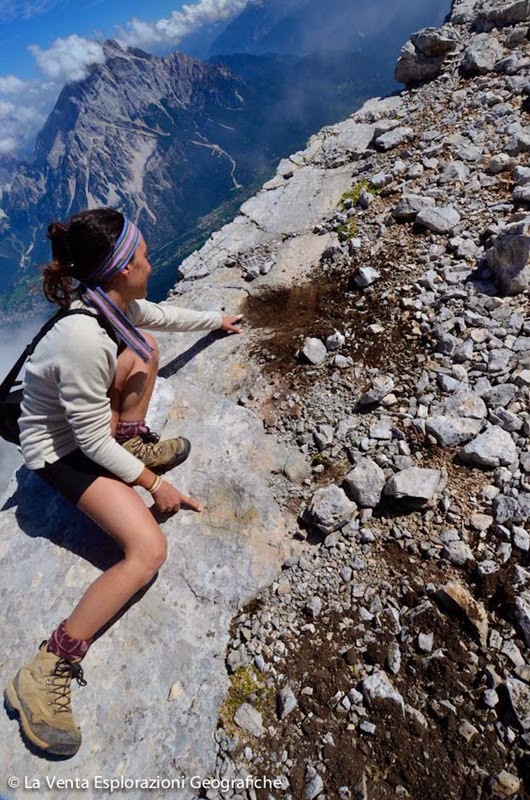 The discovery confirms the high paleontological potential of the Dolomites, a rough mountain range where the surfaces are often located on steep slopes or on almost inaccessible ridges. If the initial hypothesis is to be confirmed, the footprints are among the highest found in Europe, second only to the ones found in Switzerland on the top of Piz Mitgel (3127 meters). Further surveys are going to be conducted during the next summer season and the rocky surface of the ridge might possibly reveal new tracks in the future. In fact, other famous dinosaur tracks are located to the west, on the face of Mount Pelmetto in the Principal Dolomia rock. Marquette Backcountry skis: Forget about skins!